Tested and approved by the US Military, UtilityFlame is a light, inexpensive, non-explosive, extremely versatile product and is safe to transport by aircraft. 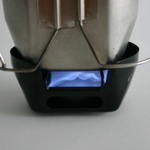 It will boil water, provide emergency sterilization, make hot MREs, enable you to reconstitute freeze dried foods, heat a cup of coffee, dry wet clothing, provide warmth and start a campfire. 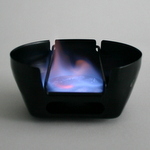 It can be used as a heat source in virtually any environment and situation. 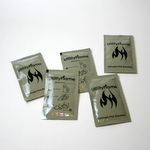 UtilityFlame is also a great companion for the casual day hiker or weekend camper. Not only is it lightweight and easy to carry, but it can be counted on to burn hot (up to 1358 degrees F or 737 degrees C) with virtually no smoke or odor to boil water or cook a meal. It is a "green" non-toxic fuel whose by-products are carbon dioxide, water and sand. For the backcountry adventurer and wilderness explorer, UtilityFlame will surpass expectations. Because it is a gel, a packet can be put into a pouch or pocket and easily carried until needed. It is odorless, non-toxic, water soluble and has an indefinite shelf life - a perfect product for the great outdoors. It will burn at high elevations, and will not evaporate, freeze, or melt. It is also a great item to have in survival / Emergency Preparedness situations. 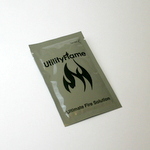 1.25 ounce packs are sold individually and the contents of each pack will burn for around 14 to 15 minutes. Using a single 1.25oz pack, a cup of water can be boiled in 3.5 minutes.